Our Christchurch Modern: A tidy round the edges.. The grout that forms the perimeter of our floor has degraded considerably with time and earthquakes - large chunks have been regularly popping out, and gouges of grout-less-ness (yes, that is a word, thank you) have been left in their wake. 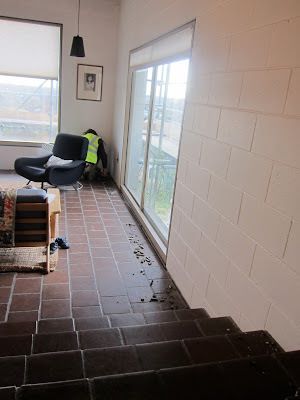 Last week, one of the 'men' spent the day indoors slowly chipping out the remaining grout bit by bit. And when we came back from a night away, we found the seam had been all filled in with lovely new grout. I was a bit concerned that the new stuff wouldn't fit in very well with the original, but we are both very happy with the result. In fact, we are pretty happy overall with all of the work so far - things seem to be going suspiciously well. Sadly, as I am a pessimist, I can't help but think things are going to take a turn for the worse sometime soon.